"Both of my daughters are vegetarians. 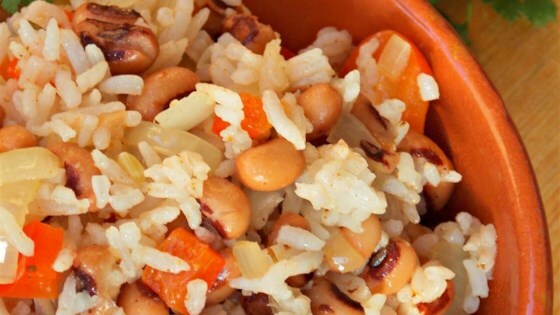 I developed this simple recipe for them to let them enjoy Hoppin' John. It can be used as a base for additional ingredients according to personal preference. This recipe was submitted to the Harvard College Dining Services and was selected as a vegetarian option for the student dining halls." Bring broth and rice to a boil in a saucepan. Reduce heat to medium-low, cover, and simmer until the rice is tender and liquid has been absorbed, 20 to 25 minutes. Heat olive oil in a pot over medium-high heat. Saute onion in hot oil until translucent, 5 to 7 minutes. Stir rice, black-eyed peas, and Cajun seasoning into onion, cover the pot with a lid, and cook until flavors blend, about 10 minutes. Rejoice, poor college students! Rejoice! A very cheap, but filling, and very healthy dish thats incredibly easy to make! I can't recommend it enough. This is really good! I added red bell pepper with the onions. Upped the Cajun seasoning to 1 tsp. Perfect for Vegetarian guests or would work nicely as a side dish or healthy lunch. Thanks! I made it. I added some Slap yo Mama and it was perfect! !